Synthetic peptide corresponding to DDDDK tag conjugated to Keyhole Limpet Haemocyanin (KLH). 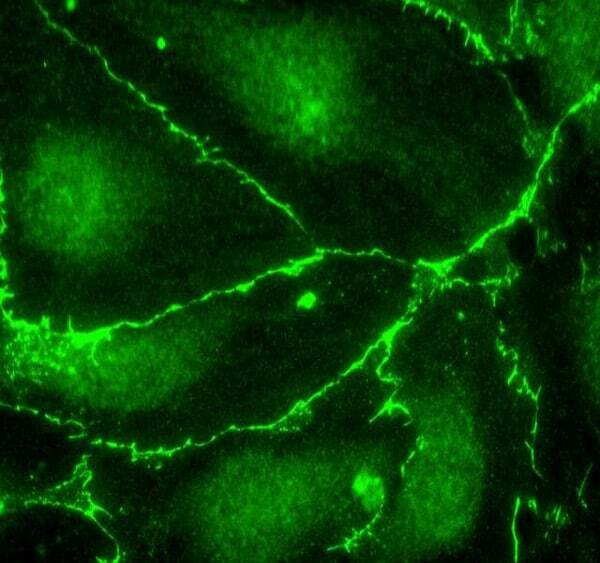 Epitope tags provide a method to localize gene products in a variety of cell types, study the topology of proteins and protein complexes, identify associated proteins, and characterize newly identified, low abundance or poorly immunogenic proteins when protein specific antibodies are not available. Tagging with xxxDDDDK may be done at the N-terminus, N-terminus preceded by a methionine residue, C-terminus, and in internal positions of the target protein. The small size of the epitope tag and its high hydrophilicity tend to decrease the possibility of interference with protein expression, proteolytic maturation, antigenicity and function. The enterokinase cleavage site allows it to be completely removed from the purified fusion proteins. Our Abpromise guarantee covers the use of ab1257 in the following tested applications. This is a useful tool for the localisation and characterisation of DDDDK tagged proteins. 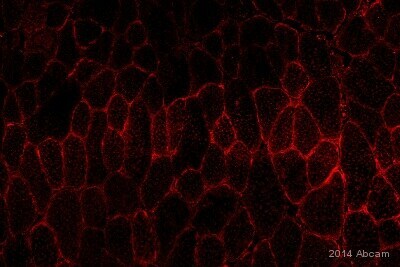 Human microvascular endothelial cells expressing DDDDK-tagged beta-catenin following transient transfection. Ab1257 used at 1 µg/ml. 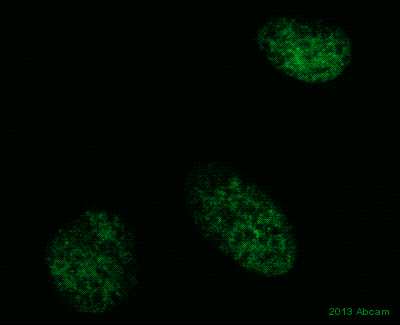 Detected with FITC labeled rabbit anti-goat IgG (H&L) secondary antibody. 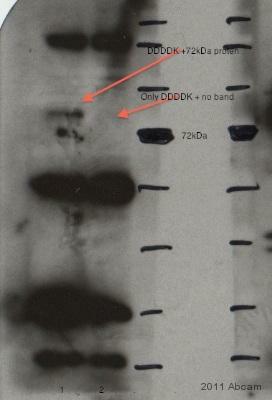 Western Blot analysis of E. coli Whole Cell Lysates, labelled with DDDDK-tagged Protein by ab1257 at 1/25,000. Publishing research using ab1257? Please let us know so that we can cite the reference in this datasheet. I would like to detect FLAG (DDDDK) by immunohistology and wanted to know if you have an antibody that you would recommend for paraffin fixed sections. We work on bone so frozen sections are a bit of a nightmare for us. 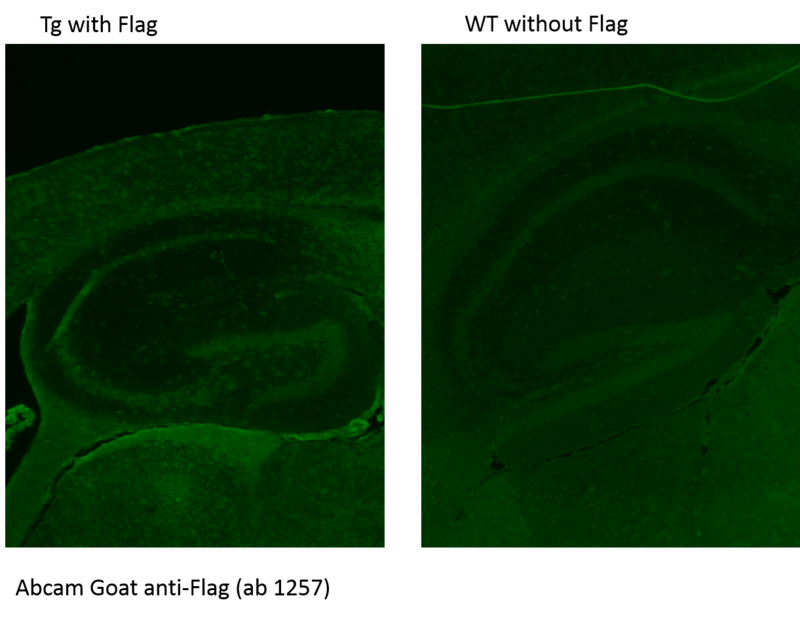 DESCRIPTION OF THE PROBLEM High background, multiple bands and wrong band size SAMPLE mouse stomach sonicated in RIPA buffer plus complete protease inhibitors (Roche # 1697498) on ice. The whole tissue extract was separated on 15% SDS-PAGE and thansfered to PVDF membrane. 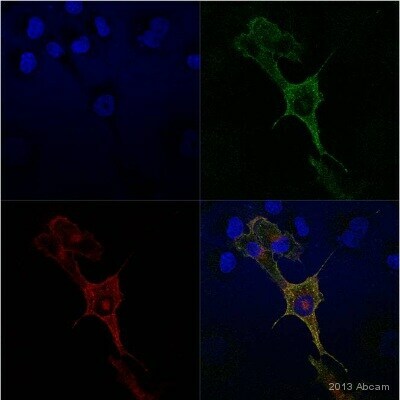 PRIMARY ANTIBODY Ab1257 goat anti-ddddk 1:1000, 1: 2000, 1: 5000, 1:10000 and 1: 15000 in PBS-T with/without 5% non-fat milk incubated for 1 hr/RT wash in PBS-T 10 minx3 time SECONDARY ANTIBODY Sigma rabbit anti-goat, HRP conjugated 1:2000, 1: 5000 in PBS-T incubated for 30 min to 1 hr/RT wash in PBS-T 10 minx3 times DETECTION METHOD ECL POSITIVE AND NEGATIVE CONTROLS USED Negative control: stomach extract without my transgene, HeLa cell extract Positive control: HeLa cell with my transgene ANTIBODY STORAGE CONDITIONS 4 C cold room in original package SAMPLE PREPARATION RIPA buffer plus complete protease inhibitors (Roche # 1697498). AMOUNT OF PROTEIN LOADED 20 ug/well ELECTROPHORESIS/GEL CONDITIONS SDS-PAGE, reducing, 15% precast gel from BioRad TRANSFER AND BLOCKING CONDITIONS Stander semi-dry transfer buffer Blocking in 5% non-fat milk HOW MANY TIMES HAVE YOU TRIED THE APPLICATION? >10 HAVE YOU RUN A "NO PRIMARY" CONTROL? Yes DO YOU OBTAIN THE SAME RESULTS EVERY TIME? Yes WHAT STEPS HAVE YOU ALTERED? 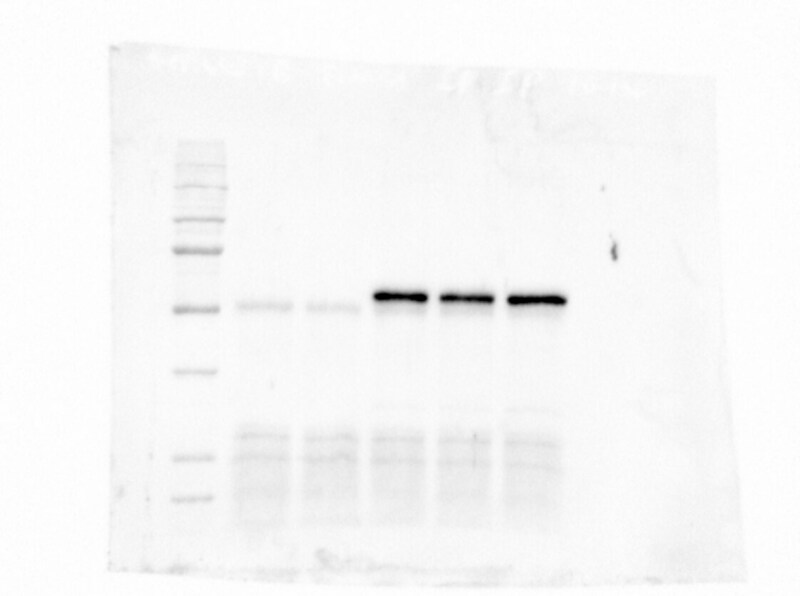 primary Ab dilution, secondary Ab dilution ADDITIONAL NOTES I used Sigma M2 Ab (monoclonal from mouse) as golden standard for FLAG tag detection. Now I turned to your product because it's cheaper. In the whole series of my western, The M2 Ab gives me a sharp, solid single band without background, which means there is no degradation in my sample. 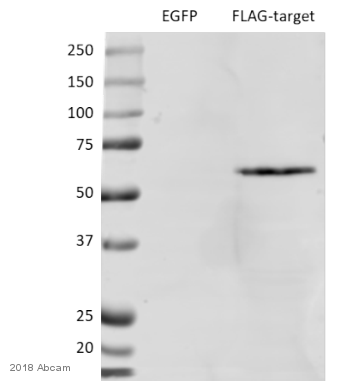 Results such as these are commonly solved by loading less lysate (try 5 mcg/lane), diluting the primary antibody more (try 1:25,000) and diluting the secondary antibody more (try 1:20,000). 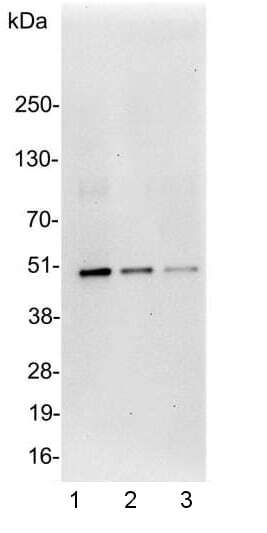 The goat anti-ECS is 10 to 20 fold higher titered than the Sigma M2 antibody. 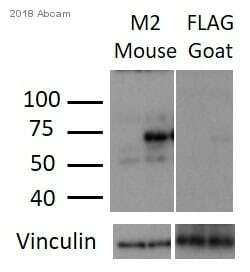 You could use the Sigma M2 antibody at 1:25 and would likely get results similar to those you are seeing with the goat anti-ECS.